Bacteria are transparent and therefore difficult to see using regular bright-field microscopy. The bacterial cells will appear just as bright as the surrounding medium and there is no color contrast. Phase contrast optics provides a solution. Phase contrast optics convert the differences in optical density (i.e. the refractive index) of the bacterial cells into different shades of brightness. The optics achieves this by interference of the light which passes through the specimen (the bacteria) with the light that goes around the medium. Phase contrast optics therefore work only if the cells have a different refractive index compared to the medium. The bacteria were grown in pure culture in an appropriate microbiology laboratory. A colony was then suspended in saline (salt water) of right concentration and then microscoped with a 1000x magnification in oil immersion (using a 100x oil objective). If one takes too much liquid, then the cells start to float in and out of focus and it is not easily possible to capture the shape of the individual cells. A similar problem can occur if the cells are much smaller than the film of liquid between the slide and cover slip. The evaporation of the liquid from the edges of the cover slip will cause a constant movement of the cells and make it difficult to take a steady picture. In this case it is necessary to heat-fix the bacteria. A colony was then suspended in saline and dried at room temperature. The slide was briefly pulled through the flame of a Bunsen burner, with the bacteria on the opposite side of the the flame. This heating process fixed the bacteria to the glass slide. Immersion oil was then directly applied to the slide and the bacteria were observed without cover glass. One disadvantage of heat fixing is, that during the drying process the bacteria may aggregate (as the volume of liquid decreases) and it may become more difficult to see individual cells. The pictures were taken on analog B/W film and then digitized with a camera and an adapter (see the following post for more info on the set-up: Digitizing photographic slides with a digital camera). The negative was then inverted and the contrast levels adjusted. The soft, slightly blurry appearance of the pictures shows that we are already at the limits of the resolution. The images were not sharpened. Notice the bright halo around the bacterial cells. This is typical for phase contrast microscopy. Thanks for you enthusiastic web microscopy resource…sweet!! I don’t know what level biology you teach, but your students must be lucky to engage your lecture/lab efforts. Somewhere I once read that thanks to inter-net/online resources and technologies..’ a science of everything’ is really approaching educators/researchers/pupils/life-time learners. By contrast with my childhood nature/science/home hobbies/microscopy path to ‘life-time learning’…your interactive web site has everything but ‘the masses of real-time pupils and visitors talking to one another…your website is a self-contained first stop for a young student microscopist! Thanks for the feedback. I teach both middle and high school Biology. I want to find what kind of bacteria are present in my stools and in particular, observe the presence of C-diff bacteria but also study the demographics of the bacteria as much as possible. I am considering buying a 1000x-2000x compound microscope with phase contrast optics. I need some guidance about how to prepare the specimen and is there in biological danger in doing this. I am a retired electronics engineer. I hope the bacteria do not have to be cultured because I do not understand the process and may not be practical for home use. Can anybody help? Sorry to disappoint you, but the type of investigations that you want to do are not possible with a microscope. 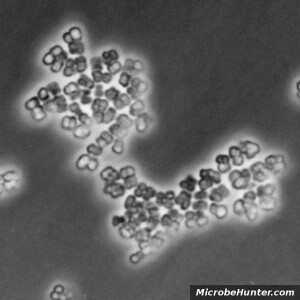 The shape of bacteria can only be used in very rare cases for identification purposes. How do you want to identify Clostridium difficile in a mix of thousands of different kinds of bacteria? Concerning biological danger: yes. You are working with unknown bacteria of human origin, which are (potentially) pathogenic. This belongs to an elevated security level. Medical diagnostics is based on biochemical reactions or the analysis of DNA, but not microscopy. There are some cases when microscopes can be used, but this requires culturing the bacteria. Generally the bacteria do have to be cultured and then isolated. This takes time, experience and extensive laboratory equipment. The cultured bacteria are then chemically analyzed. If you take a stool sample and culture the bacteria on agar plates, then you will receive thousands of different kinds of bacterial colonies. Which one is C. difficile? You would have to analyze each one of them. 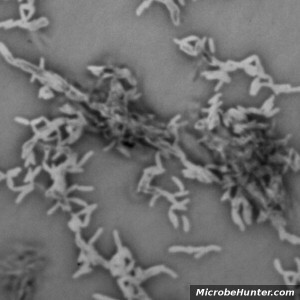 There is also another problem: Clostridia are anaerobic, this means that they do not grow in presence of oxygen. You need a special incubation chamber, in which there is no air. In short: I would not do any form of self-diagnosis, simply because it does not work. If you want to go into microscopy because of a hobby (and not for medical reasons), then I have to say that there are far more interesting things to observe than bacteria. Have a look at plain yogurt to observe bacteria. The maximum useful magnification of a light microscope is about 1000x, everything above this is empty magnification. If you want to study the demographics ob bacteria (which bacteria occur where), then you would be better off doing a PCR study….. And as a matter of fact, this is indeed done. Simply because different bacteria have the same shape under the microscope does not mean that they are related, so the microscopic appearance is often pretty meaningless. I know that this is kind of ironic. In the past, the microscope contributed greatly for understanding the microbial world, but nowadays the microscope only plays a minor role when doing bacteriological work. This is very much understandable Article unlike others. You have provided good answers for Haresh above. I wish to buy microscope which is not decided digital/analog, It is just for hobby and to improve knowledge of invisible natural creatures to the naked eye. Please suggest me which model/brand should I buy. Thanks for your awesome information which posted here. I wonder is phase contrast microscope similar to differential interference contrast (DIC) microscope. I was using the right way to culture the bacteria and using Schaeffer-Fulton endospore staining to observe the spore but I coudn’t find the spores under bright field microscope. I found some spore-like structure from malachite green and safranin which made me quite confused to identify the spores. 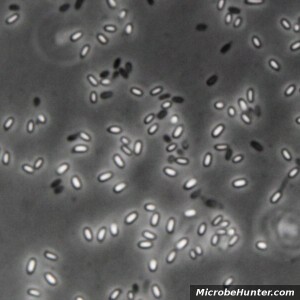 I wish I can use DIC microscope to observe my Bacillus spores without staining. My lab doesn’t have a phase contrast microscope. Thanks. You responded to my question on May 20, 2011 and I did not notice it until today. You deserve many thanks from me because the information keeps me from going on the garden path. Thanks a lot. Can I use a light microscope to demonstrate to my family the growth of bacteria in food – meat particularly – not kept in the refrigerator? I realise from this page that I wouldn’t be able to identify the bacteria. I might not even be able to see individual specimens but only where they’ve clumped perhaps. But would there be some discernible difference between a fresh or a refrigerated specimen and specimens left unrefrigerated for various lengths of time that I could use to demonstrate the need for immediate refrigeration? p.s. You write excellently and I much appreciate it. not recommended. Bacteria growing on spoiled meat are dangerous for the health. Especially those growing on meat. You know that bacteia are present simply by the smell and looks of the spoiled food, no need to do microscopy here. Spoiled food (esp. meat) is nothing to play around with, especially if children are present, as these bacteria are likely to be able to grow on one’s own body as well, causing infections. Bacteria can be transferred by streaking the meat on the slide. in which types of bacteria is obligate using the contrast phase of microscope? Bacteria that are small are difficult to see in bright field. Phase contrast is recommended for all bacteria. 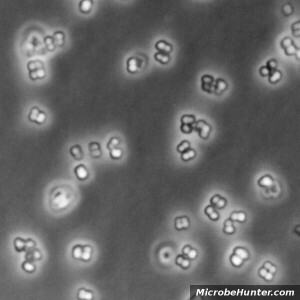 Bright field can be used well, if bacteria are stained.